Oregon starts slow but finishes fast. Once again Chip’s blur offense got the best of the Huskies and sent the dogs to the pound. As each game progresses, we can see more and more that Oregon’s defense is becoming a factor for each win. It will be a good balance for them if they reach Miami and have to play an Alabama or West Virginia type team. Props to the Florida Gators for winning their statement game. After being down 6-0 at halftime, Florida came out and scored 14 straight points while shutting out the Tigers in the 2nd half. Florida has become a 2nd half team and it shows. Gators showed that they are a team to reckon with in the SEC EAST. Gators better be ready for Vandy and not get caught looking to their match up with South Carolina. Speaking of SEC EAST, South Carolina showed they are the team to beat after smacking Georgia around 35-7. South Carolina got an early 14-0 lead and never looked back. South Carolina’s running game and defense proved to be the difference and will keep them in any game this season. 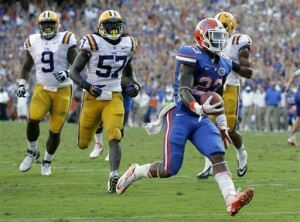 Spurrier better get the boys ready because next week it’s LSU. I think the winner of the Florida vs South Carolina match up in two weeks will decide the SEC EAST. Kansas State took care of business against their instate rival Kansas 56-14. All Kansas can do is wait until basketball season. Then they will actually have something to cheer about. Collin Klein looks to be able to lead the Wildcat offense against most BIG-12 defenses this year. I believe there is no defense in the BIG-12. West Virginia continued its massive scoring by beating Texas 48-45. Oklahoma beat Texas Tech 41-20. Then Iowa State once again made Paul Rhodes so proud by upsetting TCU 37-23. The Big-12 favorites right now are WVU and K-State. I bet that game is another 70-65 scoring affair. Is Notre Dame back? I still do not care. They did beat a hated rival, Miami, 41-3 but that still does not prove anything. Notre Dame is clicking on offense and has senior leadership on defense. This will help them through most games. Too bad most of their games that looked hard are becoming pretty easy showdowns. USC is not living up to the hype. Oklahoma is struggling and BYU looks to be a snooze. Notre Dame could very well go undefeated but it would not prove anything to me. At least the new uniforms looked cool. Poor Ohio State (not really). They are on probation and just keep on winning. I could see them finishing 11-1 or 12-0 but because of sanctions, they will get to sit at home during post season play. I hope those tattoos were really awesome and memorable. Ohio State let out all that NCAA sanctions on Nebraska this week winning 63-38. The PAC-12 still has Oregon State surprising people by being undefeated. They just beat Washington State so that proves nothing. UCLA is the biggest mystery right now. They win big when they are supposed to lose and then lose when they are supposed to win. How do you let an underachieving Cal team beat up on you 43-17? Stanford barely survived Arizona 54-48 in overtime and USC barely pulled the win out over Utah 38-28.The PAC-12 will soon be a one team conference. 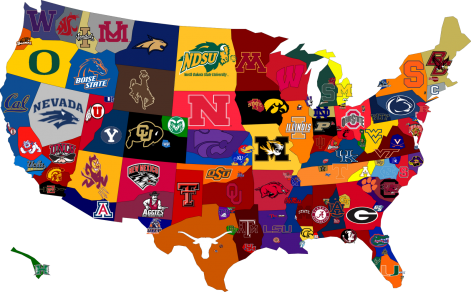 It is just a mystery when it comes to who will do well and who will just be a middle of the pack team for the year.Oregon is just miles ahead of PAC-12 teams and will need to win out and win out big to keep the conference reputation going. Can it get any worse for Virginia Tech? Beamer Ball looks to be taking a backseat this season. The Hokies drop to 3-3 after losing to NCAA sanctioned North Carolina 48-34. 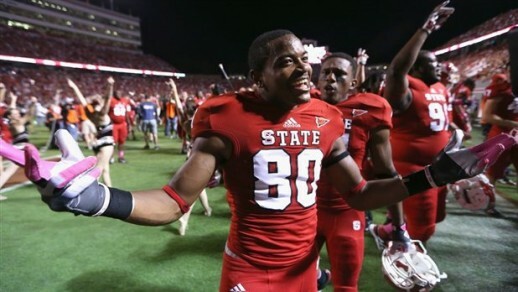 Hokies will only be able to salvage their season if they beat FSU…oh wait…North Carolina State already did that. Just make a bowl game Hokies and start looking forward to next year. Arkansas finally righted the ship by beating Auburn 24-7 but Arkansas coach still is $40 million in the hole. Auburn’s coach looks to be on a super hot seat after dropping to 1-4 on the year. I do not see a bowl game in Auburn’s future. Having looked at Florida this year compared to last year, having a good QB understanding and leading the offense makes all the difference. We almost can call this weekend separation Saturday. While Alabama had the weekend off, Oregon showed that they belong in the top rankings. There will be a massive shake up with the #3, #4, #5 teams all losing this past weekend. I still have Alabama and Oregon playing for the national championship. It looks to be Geno Smith winning the Heisman at the pace he is going. Voters love numbers and Smith is putting up MASSIVE numbers. A lot of great matchups to look forward to next week. Until next week college football nation.